Equipment: Please note: The tap water has no drinking water quality. satellite TV; DVD, CD player; internet access Wi-Fi (included); combined heating/air conditioning (in the living room). Furnishing: holiday standard, tiled floor, parquet floor. Please note: Non-smoking house. Owner lives temporarily on the ground floor. apartment, 4 - 5 people, 3 room/s, 2 bedroom/s, 1 bathroom/s, approx. 65 m², 1 floor/s, apartment on floor 1, access to the property via external stairs. Bedroom 1: Additional information: direct access to bedroom no 2. queen-size bed (1.80 m wide). Bedroom 2: (small room): bunk bed. Kitchenette: Kitchen/ cooking equipment: 4 ceramic hobs, oven, combination fridge-freezer, coffee machine, water boiler, toaster. in the living room. Living room/bed room: double sofa bed, wood stove, exit to terrace. Estate: (shared use): in a hillside, garden. Situation: in the village Soline, on an island Krk, sea view. Plot description: 2 x parking on the estate. 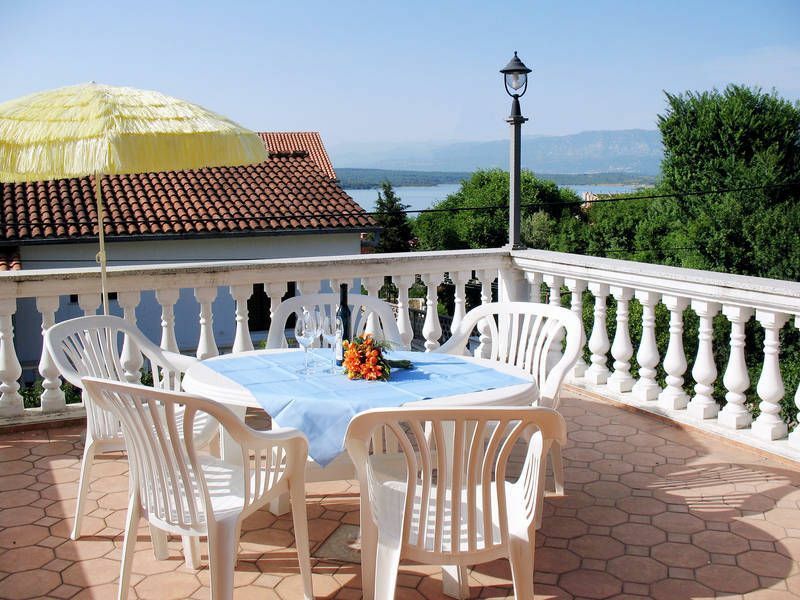 terrace 16 m², furnishing provided, 2 sun loungers. Arrival: Airport Rijeka/Krk in approx. 11 km. Beach/waters: Pebble beach in approx. 300 m. Sea in approx. 300 m.
Next village/town: Center Malinska in approx. 9.5 km. Silo in approx. 6 km. Vrbnik in approx. 13 km. Shopping: Next shopping possibility (Soline) in approx. 1.5 km. Das Haus ist gut gelegen, der Ort ist ruhig und nicht überfüllt von Turisten (obwohl wir in der Hauptsaisonzeit dort waren). Der Strand ist zu Fuß erreichbar. Es gibt Stellen am Strand mit Meeresschlamm,sodass man Schlammpackungen kostenlos erhalten kann, von der Mutter Natur. Die Vermieter sind nett, unkompliziert, zuvorkommend und stören nicht. Der Zustand der Wohnung ist gut und sauber. Wir haben uns sehr gut gefühlt.